Europeans love hatchbacks. As they should, to be honest. Hatchbacks offer practical space to fun-to-drive cars, making them the wise choice for anyone who wants something fun. But Europeans also love diesels, thanks to their frugal fuel economy, low cost of entry and low-down torque. However, diesel fuel is starting to lose its luster, thanks largely to the VW scandal. So many Europeans are switching to petrol-powered hatches, rather than diesels. If you’re looking to make that switch, what do you buy? Well, here is a comparison between two of the best, the BMW 1 Series Hatchback and the VW Golf. In this test, we take a look at the BMW 116i and Volkswagen Golf 1.4 TSI. These are the two entry-level variants for each model and come with their smallest available petrol engine. For the BMW, it’s a 1.6 liter turbo four-cylinder with 136 hp. For the VW, it’s a 1.4 liter (obviously) turbo four-cylinder with 138 hp. So the VW is more powerful while also being lighter and packs shorter gear ratios (each car has a six-speed manual here), making it the quicker car. Though, the BMW is the more frugal car, getting slightly better fuel economy than the VW. Inside, the BMW 116i isn’t as impressive as its badge would suggest. Its cabin is nice but has some rough and cheap plastics if you go searching. While the VW isn’t exactly a Bentley inside, either, it’s just a touch nicer than the Bimmer. The Golf also sports more interior space for all passengers and more trunk space as well. Credit a lot of that to its front-wheel drive layout. BMW’s 1 Series hatch has decent space for front passengers but its rear-wheel drive setup eats into rear seat and cargo space. Though, that rear-drive setup pays dividends in the handling department. 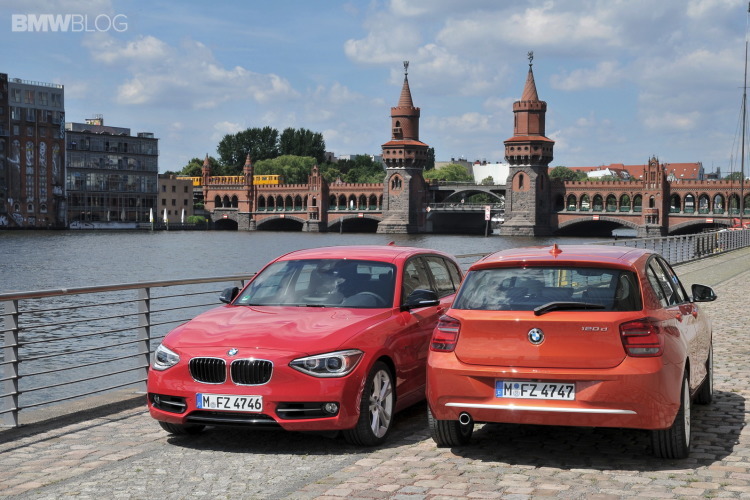 The BMW 1 Series is the more fun car of the two to drive. Its steering, uncorrupted by driven wheels, is sharper and its chassis is more playful. Plus, it’s far easier to wag the Bimmer’s tale out than the Golf’s. But this really isn’t a test of performance or handling. It’s really to find out which car should be had if you need a small, affordable, second-hand petrol hatchback. The Volkswagen Golf has shown to be cheaper second-hand, by quite a bit, and to suffer from less depreciation. So while it’s first owner might not be happy with its original depreciation, its second owner will revel in it. BMW’s 1 Series has odd depreciation behavior. The first owner actually gets lucky, as it’s slow to depreciate immediately. Though, once it’s in the hands of another owner, its value sinks dramatically. Making it the better choice to buy new, rather than used. But in a used car battle, the Volkswagen Golf wins on price. It also wins on reliability, as tests and surveys have shown that the Golf lasts longer. Thanks to its impressive build quality, more comfortable ride, extra cargo space and solid value, the Volkswagen Golf is considered the winner. The BMW 1 Series is fun to drive and does feel special but it’s not enough to take down the Golf at its own game.